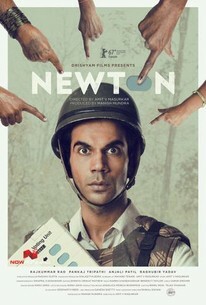 “Newton” had its world premiere at the 67th Berlin International Film Festival in the Forum section and went on to win the International Federation of Art Cinemas (CICAE) award. “Newton” has been running through festival circuits and garnering awards like the Young Cinema Competition Jury award from Hong Kong International Film Festival and has been selected as India’s entry for the Best Foreign Language Film at the 90th Academy Awards. The titular character Newton Kumar (Rajkumar Rao) is a young government clerk who volunteers for election duty on a polling booth situated in a Maoist infested jungle. Due to the imperilment that can be faced in such a conjuncture, the security forces of the area who have claimed back most of the Dandakaranya jungle from the Maoists are assigned for the security of the polling officers lead by Newton. 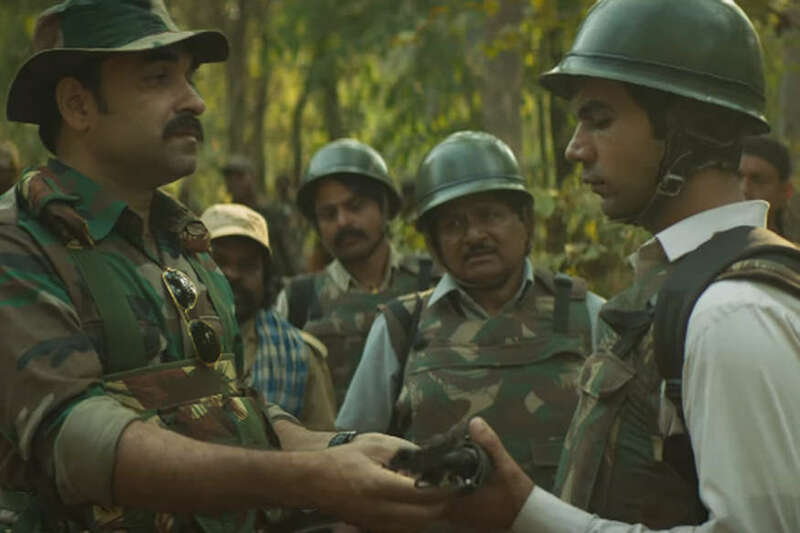 Aatma Singh (Pankaj Tripathi), the security force officer is reluctant to actually conduct the poll in the area but succumbs to the determined Newton creating an ongoing tension between the two. Along with other polling officers Loknath (Raghubir Yadav), Shambu (Mukesh Prajapathi), the local booth level officer Malko (Anjali Patil) and the group of security forces they set out through the jungle to the polling booth. The vast diversity of culture in India allows the discovery of livelihoods unheard of or thought extinct to be existing around the country. The kind of casteism, racism and the lack of respect towards the law or bluntly the futility of it is alarming however also undeniable. Beyond that, the diversity found in a locality or in a house itself concerning culture and moral obligations are immense due to (or lack of) education. Newton’s family itself is shown in such a light. Through an event of setting up the arranged marriage of Newton and the consequent scenes, the backward social structure is clearly shown while Newton himself always feels to be outside such a society while essentially he isn’t. Through a couple of simple scenes status of women, the importance given to education, the process of ridiculously setting up the marriage and the existence of caste system is well established. Newton is always shown as an oddball among most people who go with the flow. Newton himself changed his name from Nutan Kumar to Newton Kumar indicating how he doesn’t represent anything around him. Throughout the film, he tries his best to do his duty perfectly, but there isn’t a single instance where it is that straightforward. Aatma Singh who’s got experience in such conjuncture’s before considers the actions of Newton futile, especially since the scarce number of 76 voters in the area and their (lack of) knowledge and political stance. He continues to show a passive hostility towards Newton for endangering his fellow officers’ lives for an unavailing mission. Loknath and Shambu represent most of the ordinary people who want to lead their life without much complications who are good of heart but ultimately are also failing the system due to their lack of any real contributions from able positions. Malko represents the section of tribal people with education who knows better than to expect too much and be an idealist to a fault like Newton. The Maoists while never comes onscreen are an important part of the film. Their actions are never justified and their motives are never discussed nevertheless their existence is neither completely opposed. The fact that locals are safer without bulletproof jackets itself gives out a silent message. The kind of treatment given to the tribals makes it somewhat clear why some of them would choose such a path, though to what end is the question that remains to be asked. The brutality of the security force is also not totally uncalled for as they are losing fellow officers without adequate weapons and safety equipment in a jungle. Usage of frames like through doors and windows for the officers and mostly mid shots without any frame for the tribals clearly showcase their differences. The dreamy soft focus on Newton further exemplifies Newton’s disparity with others. 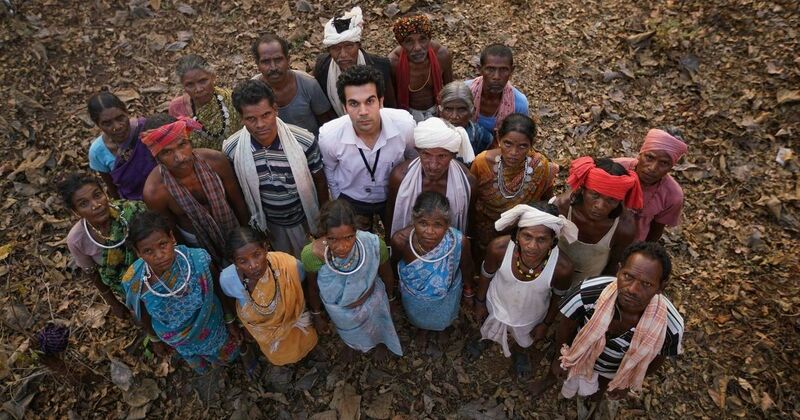 Cinematographer Swapnil S Sonawane uses such narrative tools to accentuate character traits. Newton Kumar was a character that was safe in the hands of National Award winning actor Rajkumar Rao. As a young and stubborn idealist who is not entirely sure of every step he takes, Rao yet again amazes us. Pankaj Tripathi showed that he is capable of overshadowing Rao at many instances. As Aatma Singh his hostile humor and unpredictability keep the viewers invested in the character for the turning points of the story. Though posed as a villain, his character has ample justifications for his actions which all ends up in the root problem of the bureaucracy of India. “Newton” shows that following rules exactly as they are, is almost impossible in India and most people already accept that idea. The show off in front of the media, especially the foreign ones is staged exactly targeting them. Through so many subtle commentaries and some straight questions, Masurkar has created a political satire that provides a realistic disillusionment on the government proceedings in India.